We are in hiring a Customer Support Specialist. Come and join one of the top Joomla template providers! 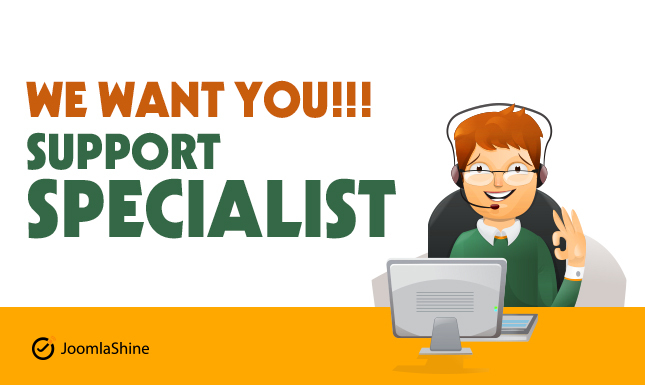 We at JoomlaShine are looking for a dedicated Customer Support Specialist to assist customers with pre-sales questions and product utilization. This person should strive to make customers-to-be happy with his guidance about JoomlaShine products: The best package to buy, how to use the product, etc. Provide pre-sales support for all matters related to the company’s product utilization in English. Contribute ideas about how to improve products based on customers’ feedback. Work 4 hours per day via e-ticket support system, forum and chat system. Time zones: UTC -1:00 to UTC -09:00, and the working time should be from 9AM to 1PM. Great writing skill in English. Ability to clearly show the benefits of products and recommend the best option to customers. Ability to offer special deals to customers at the right time. Experience with Joomlashine templates and extensions is a bonus. Experience in customer support is a bonus. I AM EAGER TO TAKE THIS JOB!